Rochester, NY – A collaboration between Cobolt AB and Semrock, Inc., has resulted in the development of optical filters optimized for use with the Cobolt Mambo™ 594 nm orange laser in fluorescence instrumentation. To realize the benefits of this new laser wavelength, optical filters that are designed with matched spectral properties are needed. Semrock has announced a number of new filters designed specifically for instrumentation based on the 594 nm laser, and ideal for excitation and detection of Texas Red®, Alexa Fluor 594®, and the popular new fluorescent proteins mCherry and mKate. A new triple-band filter set for three-color microscopy, LF405/488/594-A, consists of an excitation filter, a beamsplitter, and an emission filter for simultaneous illumination with 405, 488, and 594 nm laser lines. A complete single-band set, LF594-A, optimized for the orange laser is also now available, including a new laser-optimized dichroic beamsplitter, Di01-R594, with excellent edge steepness and precision optical flatness, and the new EdgeBasic™ BLP01-594R long-wave-pass filter designed for fluorescence imaging as well as Raman spectroscopy. These hard-coated filters from Semrock offer the simplest route to achieving exceptional images with laser-based microscopes and other instruments. Numerous important fluorescent probes, including some recently developed fluorescent proteins, are optimally excited by orange laser wavelengths. Unfortunately there has been a gap in the availability of lasers in this wavelength range suitable for applications like laser-based microscopy and flow cytometry. Existing lasers either have insufficient power or suffer from laser noise and stability issues. 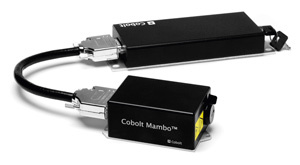 Fortunately the new 594 nm Cobolt Mambo laser, available at up to 100 mW CW output power overcomes these deficiencies and offers an ideal solution for confocal and other laser-based fluorescence imaging systems, flow cytometers, and even Raman spectrometers. "As a result of our collaboration with Cobolt to develop and release a new range of filters for the Mambo laser, our customers are able to easily complete a package consisting of laser and filters that is guaranteed to work for their applications," said Dr. Turan Erdogan, Semrock CTO. "Our solid-state laser technology provides a higher-power alternative to HeNe lasers, which opens up a new range of fluorescence applications," said Dr. Elizabeth Illy, Director of Cobolt Marketing and Sales. "Semrock filters are a perfect complement to our lasers." All Semrock catalog products have a 30-day no-hassle return policy and are covered under the company's five-year warranty. 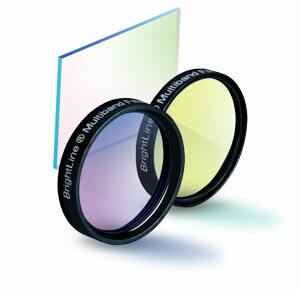 Standard sized filters are available immediately from stock and custom-sizing is available in under a week.